I was lucky enough to be at a Parsloe Athletic U15’s game for a goal fest on 28 October 2012. The game ended in a 6-6 draw but the teams were evenly matched and Parsloe Athletic U15's never gave up looking for that deciding goal, even up to the final whistle. The boys should be proud of the way they played and it was the best game of football I’d seen that weekend, especially after watching the Stoke v Sunderland highlights earlier that morning. Parsloe Athletic U15s are currently 7th in the Mid Herts Rural Minors League, U15s Division 1 and with two away games coming up they’re hoping to get those 6 points that will push them higher up the table. All the team at Garden House Solicitors continue to be very proud of the boys and in particular the way they have gone from strength to strength over the years, moving into higher divisions throughout. 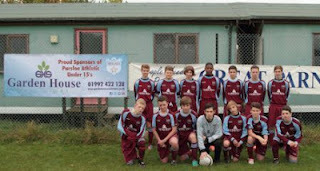 The boys even had time to take a team photograph for us before their game and before they got muddy. I for one am looking forward to the next home game, but this time I will definitely take a scarf and some gloves.